San Francisco: The Nissan Pathfinder looks like a truck, and guess what? It is one. Unlike crossover vehicles that use a car-like frame to improve comfort on pavement, the Pathfinder has a truck-like ladder frame designed for off-road performance. It's becoming rare to find a truck that's truly a truck. The hottest new SUVs all look like big, brash, brawny pickups that happened to grow a passenger compartment, but underneath their bulky sheetmetal you'll find they're actually built like a puny family car. These crossover vehicles are great if their most adventurous excursion is to the Home Depot parking lot, but anybody who needs serious off-road capability is out of luck. Unless they look at the Nissan Pathfinder. While it has the same trendy look as so many other SUVs, it's actually - get this - built on a truck frame that comes from the tough Nissan Titan. What a novel idea! That means it's designed to take a beating off the pavement, using a true ladder-style frame to give it the stiffness and strength it needs to survive off-road driving. It's a proven, time-tested, old-school design that works wonderfully for navigating rough terrain, but it's disappearing so fast that it ought to be on the automotive equivalent of the endangered-species list. More and more car manufacturers are moving away from the truck-style frame because it has several inherent drawbacks when you're driving on pavement. For one, it's heavier than unibody construction, so you get lower gas mileage and less precise handling than with a car-like SUV. For another, it allows the cabin to wiggle and shake much more than in a typical car, and that translates into more noise and a sloppier feel as you drive down the road. It's clearly designed for traveling over rough terrain and hauling heavy loads - the kind of jobs trucks are meant to do - rather than floating serenely around town like a crossover SUV. With a tall ride and relatively stiff, bouncy suspension, you definitely know you're behind the wheel of a truck, but it's not so awful that you can't enjoy yourself on the highway. Lots of sound insulation keeps wind and road noise out of the cabin for the most part, and a smooth V6 engine - an enlarged, modified version of the one in Nissan's 350Z sports car - pulls you along with ease. Inside, you'll find a nice cabin with three rows of seating, two of which are comfortable. The third-row seat is best for children on long trips or adults on short ones. Depending on how much you're willing to spend, the Pathfinder can range from an economy cruiser to near Land Rover levels of luxury. Pricing starts at $24,650 for the Pathfinder XE, which comes with fabric seats, air conditioning, cruise control, power everything and keyless entry. The SE ($25,850) adds a power driver's seat, running boards, roof rack a few other small things. Off-road enthusiasts will like the Pathfinder SE Off-Road ($28,450), which adds off-road tires, Rancho brand off-road shocks, and skid plates. High-end luxury comes in the Pathfinder LE ($32,550), which includes leather seats, wood trim, a sunroof, Bose stereo with CD changer, and 17-inch wheels. Options include a DVD navigation system ($2,000), an air bag package ($700), and a rear-seat DVD player with wireless headphones ($1,600). Four-wheel drive is also available on all models for around $2,000. 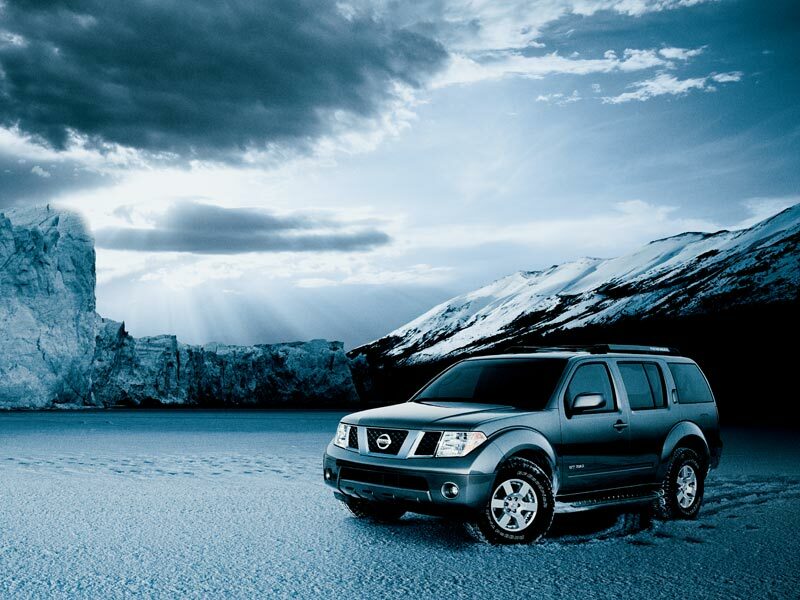 No matter which version of the Pathfinder you get, it'll be a truck that doesn't just look like one. And that's something special nowadays. What was tested? 2006 Nissan Pathfinder LE 4X4 ($34,750). Options: DVD navigation package ($2,000). Price as tested (including $560 destination charge): $37,310.